Satay, grilled skewered pieces of meat, was not supposed to be the highlight of that day. Rather, Portuguese Grilled Fish in downtown Chinatown / Petaling Street in Kuala Lumpur. It was the 15th May, 2008 and I finally got to me Bee Yinn of Rasa Malaysia after knowing and reading her blog for well over a year. As we were a little bit early that day, we decided to stop by at Zainal’s Satay which is located along the road leading to Petaling Street. If you are coming in into Petaling Street from the traffic light junction of KotaRaya, you will see Zainal’s Satay on the right hand side of the road. This was my first time eating Zainal’s Satay though I pass by this place almost daily. The chilli peanut gravy which came along as an obligatory dip for the satay was slightly above average though I must say that Nyok Lan’s is still better. Unfortunately, a couple of drips found its way to the back of my white shirt as the stall assistant was scooping some for the next customer but luckily, the stain has been fully removed with the able strength of the friendly liquid detergent. Anyway, back to the satay. The condiments which came along were a little on the stingy side. I think there were less than 10 pieces of cucumber which adorned the sides of the plate. satay!!! I’m a crazy satay fan! Thanks for the satay and grilled fish treat. klaw : Nyok Lan satay is directly opposite the Kajang Police Station. Ah, thanks…is the stall called nyok lan? I’ll go hunt it down next weekend. It looks incredible. Does it taste as good as it looks? klaw : The satay stall is Nyok Lan. It is situated within Restoran Malaysia. It’s a corner shop. Thegrubhound : Absolutely! It is one of Malaysia’s best loved food / snack. I believe it is also found in Indonesia. I am jealous. You guys get to meet and eat (satay and portugese grilled fish) I am gonna dream about the duo dish tonight. reese : You come KL and we go makan makan, kay? Yes, will def call you folks when I drop by. I have a strange cravings for apam balik lately. They don’t have it here, tough luck! 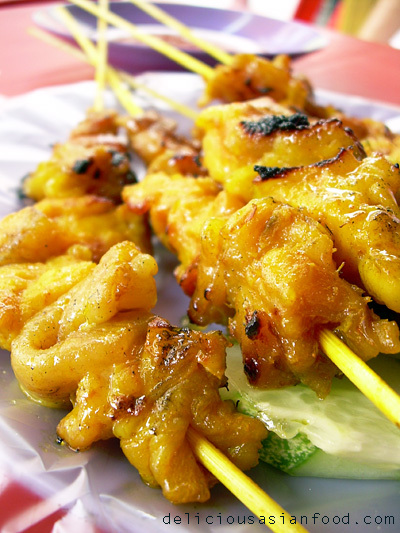 That is one of the best food in Malaysia..I’ve heard of it Travel Asia…No doubt because all of the people who commented in here really loves Satay..
Pablopabla you should make a satay recipe! Pleeaasee….? nak contact number satay yg best except 4 hj samuri..
nice satay, my all time favourite. Cheers, have a nice weekend!